Answering Muslims: Theresa Corbin: A Muslim Feminist? 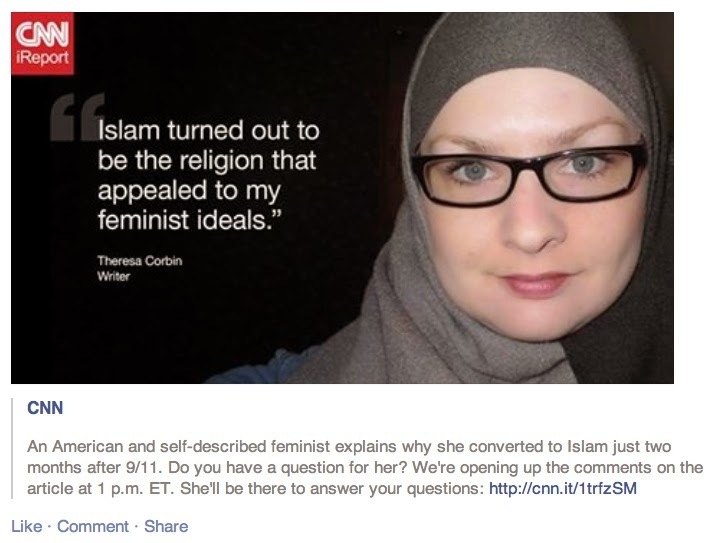 Theresa Corbin: A Muslim Feminist? Whenever there's a series of particularly violent jihadist attacks, CNN rushes to defend Islam, typically by telling us over and over again what a wonderful religion it is. I suppose the administrators at CNN mean well. They're probably thinking to themselves, "We need to protect peaceful Muslims from being associated with these violent extremists, and the best way to do that is to tell our readers and viewers that Islam is a religion of peace, tolerance, human rights, freedom, and democracy." What CNN ends up doing in their rush to defend Islam, however, amounts to proselytizing for Islam. Some of the articles sound as if they're actually trying to convert people. Moreover, since CNN obviously doesn't bother to check the facts in the articles they post (doing so might be thought "racist" or "Islamophobic"), the network is being used to spread outright deception. Let's look at an example. 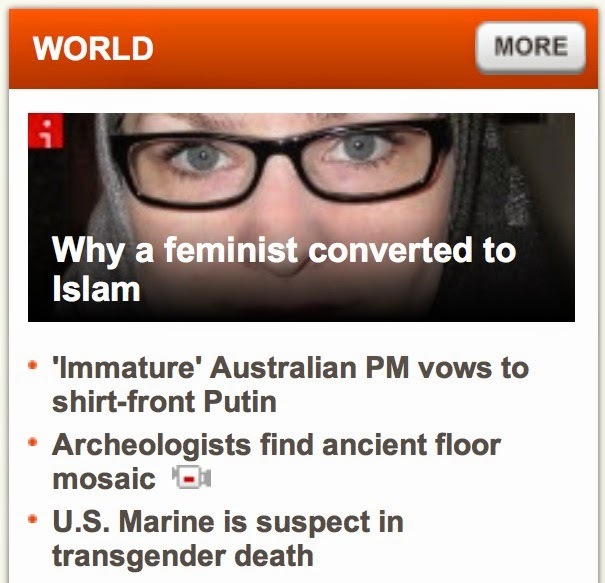 CNN's latest attempt to convince us that Islam is the ideal choice for Western readers is Theresa Corbin's "I'm a Feminist, and I Converted to Islam." Maybe we should go through some of the article. (CNN)—I am a Muslim, but I wasn't always. I converted to Islam in November 2001, two months after 9/11. 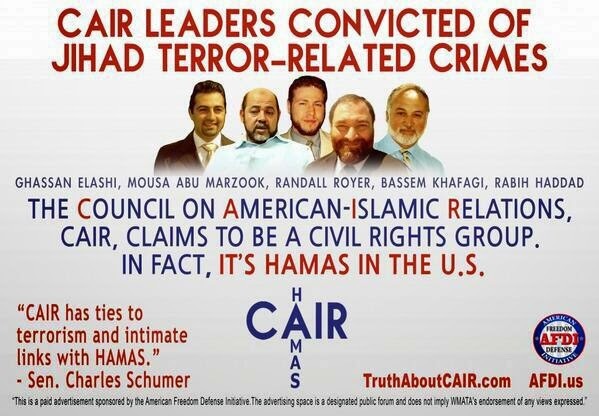 So Corbin was part of the surge in Muslim converts following the 9-11 terrorist attacks. These conversions were the result of three primary factors: (1) politicians and the media bombarding us with pro-Islamic misinformation, (2) a silly tendency among many Westerners to try to be "different" by adopting a controversial position, and (3) a misguided notion that converting to Islam is somehow helping to rescue a peaceful religion from its hijackers. Given her defense of Islam, I have serious doubts that any of this "four years of studying" amounted to anything remotely resembling a careful examination of Islam. More on this below. I am the product of a Creole Catholic and an Irish atheist. I grew up Catholic, then was agnostic, now I'm Muslim. My journey to Islam began when I was about 15 years old in Mass and had questions about my faith. The answers from teachers and clergymen—don't worry your pretty little head about it—didn't satisfy me. If she couldn't find a single Christian apologist or a book on Christian apologetics, how hard could she have been looking? Going against the grain! What a rebel! Qur'an 9:29—Fight those who believe not in Allah nor the Last Day, nor hold that forbidden which hath been forbidden by Allah and His Messenger, nor acknowledge the Religion of Truth, from among the People of the Book, until they pay the Jizyah with willing submission, and feel themselves subdued. Qur'an 9:73—O Prophet! strive hard against the unbelievers and the hypocrites and be unyielding to them; and their abode is hell, and evil is the destination. 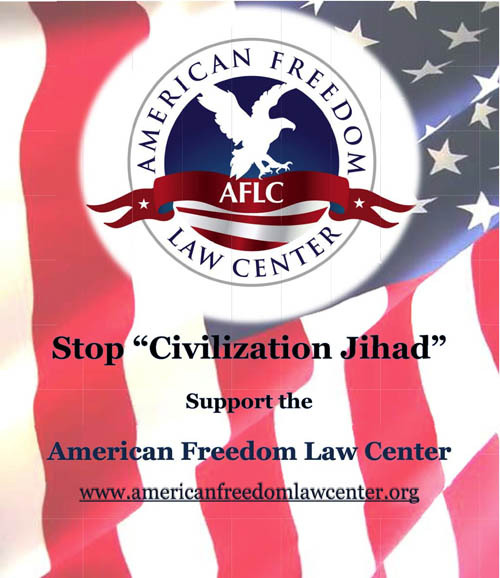 Qur'an 9:111—Surely Allah has bought of the believers their persons and their property for this, that they shall have the garden; they fight in Allah's way, so they slay and are slain. Qur'an 9:123—O you who believe! fight those of the unbelievers who are near to you and let them find in you hardness; and know that Allah is with those who guard (against evil). Qur'an 48:29—Muhammad is the Messenger of Allah, and those who are with him are severe against disbelievers, and merciful among themselves. Sahih Muslim 4366—It has been narrated by Umar b. al-Khattab that he heard the Messenger of Allah (may peace be upon him) say: I will expel the Jews and Christians from the Arabian Peninsula and will not leave any but Muslim. Al-Bukhari, Al-Adab al-Mufrad 1103—Abu Hurayra reported that the Prophet, may Allah bless him and grant him peace, said, "Do not give the People of the Book the greeting first. Force them to the narrowest part of the road." Sahih al-Bukhari 6922—Allah's Messenger said, "If anyone changed his Islamic religion, kill him." As I studied the faith, I was surprised many of the tenants [sic] resonated with me. I was pleased to find that Islam teaches its adherents to honor all prophets, from Moses to Jesus to Mohammed, all of whom taught mankind to worship one God and to conduct ourselves with higher purpose. John 5:22-23—Moreover, the Father judges no one, but has entrusted all judgment to the Son, that all may honor the Son just as they honor the Father. Whoever does not honor the Son does not honor the Father, who sent him. I was drawn to Islam's appeal to intellect and heartened by the prophet Mohammed's quote, "The acquisition of knowledge is compulsory for every Muslim, whether male or female." Sunan Ibn Majah 224—It was narrated that Anas bin Malik said: "Seeking knowledge is a duty upon every Muslim, and he who imparts knowledge to those who do not deserve it, is like one who puts a necklace of jewels, pearls and gold around the neck of swines." Sunan Ibn Majah 54—It was narrated that Abdullah bin Amr said: "The Messenger of Allah said: 'Knowledge is based on three things, and anything beyond that is superfluous: a clear Verse, an established Sunnah, or the rulings by which the inheritance is divided fairly.'" Sunan Ibn Majah 258—It was narrated from Ibn Umar that the Prophet said: "Whoever seeks knowledge for a reason other than for the sake of Allah, or intends it for a purpose other than for the sake of Allah, let him take his place in Hell." Sunan Ibn Majah 3837—Abu Hurairah told that the Messenger of Allah said: "Oh Allah, I seek refuge with You from four things: From knowledge that is of no benefit, from a heart that does not fear (You), from a soul that is never satisfied, and from a supplication that is not heard." Sunan Ibn Majah 3843—It was narrated from Jabir that the Messenger of Allah said: "Ask Allah for beneficial knowledge and seek refuge with Allah from knowledge that is of no benefit." This claim certainly isn't based on any studying whatsoever. Instead, it seems that Corbin simply went to the "1001 Inventions" exhibit at the National Geographic Museum. There's no way she would assert that Al-Khwarizmi "invented algebra" or that Ibn Firnas "developed the mechanics of flight" if she had actually read a book on algebra or flight. The only extant source for the claim that Ibn Firnas flew is from seven centuries after his death, and it merely claims that he covered himself in feathers, attached two wings to himself, flung himself into the air, and injured himself when he landed. Is this what qualifies as proof that he "developed the mechanics of flight"? Even if we grant that the story about Ibn Firnas is true, why not give the award for flight mechanics to the Chinese, who invented the kite more than a thousand years before Ibn Firnas and who even developed kites that could lift human beings into the air? As for Al-Khwarizmi inventing algebra, that's sheer nonsense. The Babylonians new some basic algebra a millennium before Al-Khwarizmi was born, and Diophantus of Alexandria took algebra much further in the third century AD. 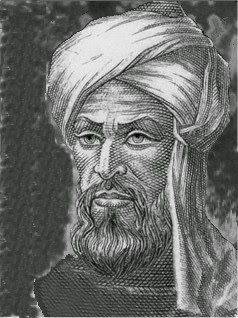 Since Al-Khwarizmi drew much of his work from Hindu mathematicians, we can only wonder why Muslim apologists still circulate the myth that he invented algebra (and why an erudite "feminist" like Theresa Corbin would believe the myth without so much as a 30-second visit to Wikipedia). Qur'an 5:101-102—O ye who believe! Ask not questions about things which, if made plain to you, may cause you trouble. But if ye ask about things when the Qur'an is being revealed, they will be made plain to you, Allah will forgive those: for Allah is Oft-forgiving, Most Forbearing. Some people before you did ask such questions, and on that account lost their faith. 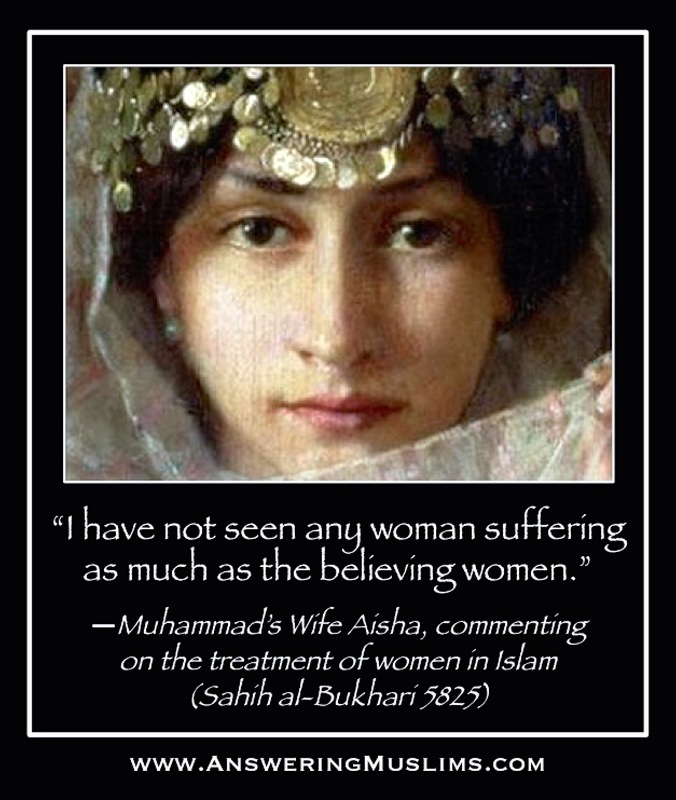 Beyond this, Muhammad declared that women are intellectually deficient. How is Corbin going to question the world around her when her prophet says that she simply isn't smart enough? (1) Theresa Corbin is a "feminist." 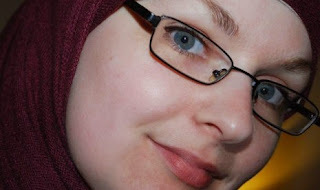 (2) She studied Islam for four years before converting, but never managed to actually read any authentic Islamic sources. (3) Instead, she believed everything she was told by Muslim apologists, and it never occurred to her to look things up. (4) Because she still hasn't bothered to study the Islamic sources, she makes claims about Islam that totally contradict what Islam actually teaches. (5) CNN posts her story on its front page, without correcting any of her false claims. (6) Her story is now used to recruit more gullible women to a religion that considers them intellectually deficient. Welcome to the new face of American feminism! Islam is the most violently misogynistic religion in the world. Globally, eleven of the twelve countries most oppressive towards women are Muslim-majority countries. Women are being raped by jihadists as we speak (and the Qur'an allows it). And instead of confronting Islam, American feminists are defending it. But don't ask them to "worry their pretty little heads." I suppose swapping the hijab with a dunce cap is due. This is one of the best and most powerful articles on your site. Everone must try their best to share it with as many as possible. Good article, David. Sadly, Roman Catholic teachers are often ill-equipped for difficult questions, but Ms. Corbin should have understood that Christianity has a very rich intellectual tradition behind it and she is not the first person to have asked these questions. I have never heard of a Catholic clergyman saying something like "don't worry your pretty little head about it," so I doubt the truthfulness of her claim that this was the line of teachers and clergymen. I believe you're right about her. She was and is very superficial in her quest for truth, assuming of course that her account isn't largely made up for self-promotional or apologetic purposes. The comment am about dropping here has got nothing to do with the topic on ground but I think it's becoming too often in Nigerian that babies are born with the Quran in their hand. The question am posing to Muslims is just simple. If this babies are trully born with the Quran, at least they should contain the missing chapters and verses. Where are the chapters and verses they contain that present Quran don't have? "My journey to Islam began when I was about 15 years old in Mass and had questions about my faith. The answers from teachers and clergymen—don't worry your pretty little head about it—didn't satisfy me." CNN's pro-Islam article is full of lies from start to finish, lies that go unchallenged. This isn't journalism; it's proselytizing. Why is CNN shoving Islam down our throats? I am Catholic. 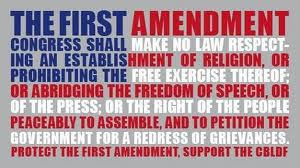 I am used to being interrogated, raked over the coals, put on the spot and having people demand that I defend my faith. Why did CNN not subject this dishonest and not very intelligent woman to the same critical process Catholics are exposed to? In any case, her quote, above, is as phony as a three dollar bill. "Don't worry your pretty head" -- does anyone really believe that any Catholic ever said that to her? The line is a cliche from an old movie. It's not something a Catholic priest or nun would say in real life. This girl is delusional. Why are her delusions suddenly elevated to the status of CNN reporting? none of your Sunan Ibn Majah hadeeth are sahih . So if u use their false sources (they can refute) you become a "liar " as them. Another very very dumb westerner. Sometimes I wonder what would westerners do when Islam takes over this country?. Sometimes I wonder that being a dumb blind westerner is a mental disorder or not?. Bob Morane said: "none of your Sunan Ibn Majah hadeeth are sahib. So if u use their false sources (they can refute) you become a 'liar' as them. Be careful, be honest so u can win against them." First, you seem to be under the delusion that all Muslims only accept Sahih hadith (and that I accept their methodology). This is nonsense. How do you think non-Sahih hadith were recorded if they were universally rejected? Second, Corbin quotes Muhammad as saying that all Muslims must seek knowledge. This hadith is not Sahih. So Corbin is among the Muslims who accept non-Sahih hadith, which is exactly what I gave her. So why are you calling me a liar for applying the same standard she uses? Before you're going to accuse someone of lying, you should at least attempt to (1) know what you're talking about, and (2) follow the argument (here, that if Corbin accepts the hadith she quoted, she must also accept other things Muhammad said on this topic). In fact, if you're going to start throwing around personal attacks based on your own lack of understanding, do it somewhere else, Bob. This lady does have a facebook page. You should send her a private message. Also, what is it about Roman Catholics and converting to Islam? Is there any ways to warn the church that Catholicism is not providing the answers that Catholics seek, which are being exploited by Muslims who want to perform da'wah on them? Unfortunately, the Deen Show with a million plus followers on facebook, publishes similar stories like hers for da'wah. I really wish someone can call out Eddie and challenge him to either debate or host one. David this is a slamdunk! This goes straight to the core of the matter. Muslims lie so much that any thinking person will have no trouble in exposing them for what they truly are- LIARS!. This so called feminist failed to do her basic due diligence that is expected from a kindagarten pupil. She completely exposed herself for the ignoramus she is on the issues of islam and its teaching. I will not be surprised if I hear next that she is on her way to Syria to fight for isis. Christian apologetics must be taught to all school going children to expose islam and prevent them from the deception of the cult of mohammed. This is a very thought provoking article. My respect. I think Bob Morane is a fake guy. He seems to be a member of the cult of mohammed. I can not imagine how shallow he is. The nonsense Bob wrote beats me when the issue at stake is.. people going to hell because of the deception of islam. I think it is very irresponsible of him to try and use different standards when the lady in question appealed to the same references that David expounded upon. Bob or whatever your name is.. if you do not have any positive thing to contribute, sometimes its wise to stay silent. As long as I have known David, he has quoted documents with references, which of course is expected from all scholars not to talk of someone of David's caliber. Great Job David! The silliest is Kecia Ali who shows her ignorance of languages with noun gender such as Arabic, French, Spanish, etc. According to her, because the quran says that Allah created people from a single soul and soul is a feminine noun, it means that the first created was female. To give an example from French, where âme (soul) is a feminine noun: in French the word for soul is âme and the soul of Adam would be "l'âme d'Adam". Just because âme is feminine doesn't mean Adam is feminine even if I don't mention Adam "nous venons d'une âme", which means we come from a single soul. Now, how do those "feminists" interpret qur'an 4:34 permitting husbands to beat their wives but not the other way around. Or qur'an 65:4 permitting the divorce!!! of pre-pubescent girls ( who have not menstruated). Now, that is something I would like to hear. Back to the more serious stuff! I have been sending David's articles here to editors of newspapers whenever I read of them trying to write something falsely good about Islam...and like everyone here knows, there are plenty these days. After coming to this website for some time I feel compelled to expose all these fake teachings about Islam. So again, thank you to Dr Wood and his band of apologists. [SG in https://www.blogger.com/comment.g?blogID=6590312557191237519&postID=370732530494276474]"I'm referring to the Gospel of Thomas in regards to the infancy narrative. Not a reliable gospel that's been rejected long ago." The bird story at Quran 3:47 isn't heretical. for I have not yet ascended to Abbi [my Father]. and Allahi [my Allaha] and Allahkuon [your Allaha]." [SG]"The whole '70% Aramaic' bit is particularly puzzling and overreaching by the author." Mingana, Alphonse. 1927. "Syriac Influence on the Style of the Kur'an"
We must remark, however, that the very restricted knowledge which all the Muslim authors had of the other Semitic languages besides Arabic often renders their conclusions very unreliable and misleading, and the critic should use great caution in handling their books, which at best are only good as historical preambles to the subject under consideration. and Syriac (including Aramaic and Palestinian Syriac) about 70 percent. The Syriac influence on the phraseology of the Kur'an may be considered under six distinct headings: (a) proper names, (b) religious terms, (c) common words, (d) orthography, (e) construction of sentences, (f) foreign historical references. Wrong post to be commenting in, but I'm sure it'll be moved or deleted. To answer your question about Thomas, the fact that the church agreed (and everyone does now) that it contains false narratives and sayings of Jesus does deem it heretical. It was written two centuries after Thomas' death too. The truthful fragments in it are from the synoptics. Oh and I'm not arguing about any Syriac influence (especially names). Just the notion that 70% of the Quran is Aramaic and misunderstood/misinterpreted by Muslims. As I mentioned before, the hadiths affirm the Quran's messages from Muhammad himself. Unfortunately, the Deen Show with a million plus followers on facebook, publishes similar stories like hers for da'wah. I really wish someone can call out Eddie and challenge him to either debate or host one." Eddie has been requested to a challenge many times. As far as I know, he doesn't give the courtesy of responding to decline the invitation. That was a few years ago; for, I have not kept up with him and his show as of late. [SG]"about Thomas, the fact that the church agreed (and everyone does now) that it contains false narratives and sayings of Jesus does deem it heretical"
Gospel of Thomas the Israelite? Do you think that _everything_ in it is heretical? Do you think parts of it are orthodox? Barnstone, Willis. 2009. _The Restored New Testament: A New Translation with Commentary, Including the Gnostic Gospels Thomas, Mary, and Judas_ (NY: W.W. Norton & Company), 1485pp, 547-574. "I'm not arguing about any Syriac influence (especially names)." Hirschfeld, Hartwig. 1902. _New Researches into the Composition and Exegesis of the Qoran_ (London: Royal Asiatic Society), 155pp. A conspicuous feature of this _sura_ [sura 19] is the employment of the term _Al Rahman_ for Allah no less than _eighteen_ times. Sprenger is of opinion that the term stands for Christ. This is however, impossible, since Maryam herself places her hope in Al Rahman before Jesus is born (v. 18). Besides most of the passages in which that name occurs treat of other prophets. Abdul-Haqq, Abdiyah Akbar. 1980. _Sharing Your Faith with a Muslim_ (Minneapolis, MN: Bethany House Publishers), 189pp., 188. I'm betting that an early version of Sura 1:1 spoke of Allah, al-Massih Isa, and Allah's Spirit-- a trinitarian formulation. For comparison, see the baptizing line below. "All shultan [authority] in heaven and on earth is given to me. and (of) the Rukha d'Qudsha [Spirit of-Holiness]. And teach them to keep all that I have commanded you. until the end of the ailma [world]." "the hadiths affirm the Quran's messages from Muhammad himself"
The Quran says that Muhammad lacked any signs/miracles to show to onlookers to establish his credentials (Sura 17:90+). The only 'miracle' he could present was the Quran (Sura 29:50+). Do "the hadiths" say that Muhammad did miracles?